You are purchasing a $200 gift voucher to use for any services at CellSpark Skincare and Wellness with locations in Woodbury or Edina. CellSpark is committed to bringing a more natural and holistic approach to your beauty and health regimen. We can repair injuries to bone, tissue, muscle and the nervous system without discomfort. Our treatments heal the skin and body from the inside out with the use of the unparalleled Axion Micro5 microcurrent machine. The Axion is a frequency specific microcurrent machine which directs the exact amount of current needed to dramatically heal damaged cells. For those of you who are not quite ready to jump into something new with your skincare, we do offer chemical peels in varying strengths and microdermabrasion with the Dermaglow II Professional microdermabrasion machine. This machine is one of the most powerful microdermabrasion machines on the market. CellSpark is also excited to have added essential oil services and all natural, homemade skincare products along with essential oil based remedies for hundreds of physical and emotional issues. Our homemade, all natural skincare products can be purchased at our locations or on Etsy. 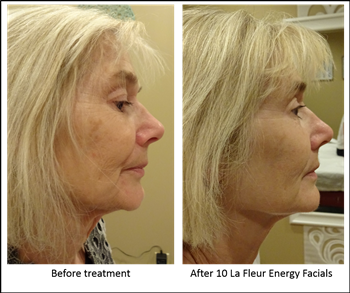 Microcurrent Facial – The “Lunchbreak” Facelift! The Axion micro5 facial process can dramatically improve the appearance of your skin by providing optimum help and reversing the effects of aging. There is no pain, harmful electrical stimulation, or strong chemicals of any kind used in the process. Using computer automation this facial instrument constantly measures the condition of your skin and the underlying tissues. A probe is applied to the skin, submitting a very subtle electrical stimulation which enhances the vitality of your skin by improving the health of the underlying cells. Injury and Chronic Condition Recovery - microcurrent therapies are a fast and effective solution for relieving pain, recovering from injury, and managing chronic conditions. It's an excellent choice for athletes whose bodies often demand performing at the peak level. ​Scar Prevention-microcurrent is a true answer to people who want to diminish the chance of scarring. Scarring can be greatly minimized and inflammation reduced when treatment is performed as soon as possible after a surgery or injury.